Many people in the Washington DC area are seriously injured or die each year as the result of a collision between a bicycle and a motor vehicle, and the deaths have been on Bike Accidentthe rise. Experts believe that environmental, health and financial concerns have led to people ditching their cars in favor of bicycles. This is a wonderful thing! However, cycling has the potential to be quite dangerous, and those with a passion for it need to learn to be extra careful to keep themselves safe. Always maintain a safe distance between your bicycle and the traffic around you. Use bicycle lanes wherever they are available. Put reflectors on your bicycle if it doesn’t already have them. Wear light-colored or reflective clothing if cycling at night. Place a light on your helmet, which can both increase your visibility as well as make you more visible to others. Use hand signals so drivers know what you’re planning to do. Wear additional protective clothing, such as knee or elbow pads. If you’re hit by a car and find yourself on the ground, your first job is to assess your injuries. If you’re severely injured, you obviously might not be able to do this. If your injuries are minor, and you find that you can easily move without severe pain, your next step is to get off the road. This will prevent you from being hit by another vehicle. Another important aspect of assessing the situation is noting down the license number of the vehicle that hit you. Hit and runs often occur because drivers are terrified of being jailed for injuring someone. The driver might stick around a second to see if you’re okay and then try to take off before the police arrive. If you were hit by a car in a public place, chances are that the driver or someone else who witnessed the accident will call for help. If you’re able to, you’ll need to give a report to the police. Witnesses will give their reports at this time as well. Even if you don’t think your injuries are serious, it’s best to take an ambulance to the hospital. Your body goes into shock after an accident, and you might not be aware of the severity of your injuries. The EMTs will have the tools and experience to properly assess you and make sure you stay safe on the journey to the hospital. If you’re injuries are minor, and you’re stable enough to talk to people, it’s a good idea to get the phone numbers of people who witnessed the accident. Even if they stick around to give a statement to police, your attorney might need to contact them later. If your phone wasn’t damaged in the accident, you can snap a few photos of the scene, including the license plate of the car that hit you. This is the easiest way to get the license number, although you might not be able to do it. Other things you might want to photograph include your injuries and your damaged bike. Be sure to get a proper medical assessment before going home, especially if you were hit in the head. A head injury can feel minor and end up killing you later due to internal bleeding and pressure. It’s also important that you be checked out right away for legal reasons. You could be owed compensation for the damages done to you, but if you don’t get assessed right away, it could be argued in court that your injuries happened as the result of a later incident versus the accident. 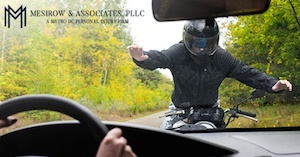 It’s a good idea to talk to an experienced bike accident attorney to see if you might have a case. Don’t assume that you don’t just because the accident was the result of an honest mistake. Whether or not you choose to go forward with your case, it can’t hurt to have the situation assessed by a professional. If you’ve been hurt in a bike accident and would like to speak to a bike accident attorney in the Washington DC area about the situation, please contact us today.